Kenny Shiels' Derry City reign got off to a losing start as Finn Harps earned a deserved 2-1 victory in the League of Ireland Premier Division opener. Debutant Jordan Allan first two first-half chances for Derry with Gareth McGlynn also going close before David Scully put Harps ahead on 45 minutes. Former Derry player Ryan Curran strode through the Candystripes defence unhindered to double the lead on 75. 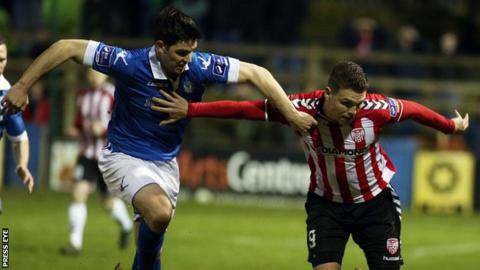 Rory Patterson replied in injury-time but it was too late for Derry. Harps keeper Ciaran Gallagher endured a nervous moment deep into injury-time as he appeared to misjudge a cross into his box but he wasn't punished as the home outfit held on to earn their first win over Derry since 1998. After appearing to start well, Derry lost their way badly in the contest as former Brandywell players Barry Molloy and Tony McNamee impressed in the Harps midfield. McNamee introduction for Sean Houston midway through the first half meant that he was up against his brother Barry, who was in Derry colours. Scottish player Allan missed a great Derry chance in the first minute as he headed a Gareth McGlynn cross wide. As Derry made the brighter start, Harps defender Damien McNulty bravely blocked a McGlynn close-range effort before Allan header over in the 40th minute after Gallagher had flapped at a corner. The key moment of the game came in first-half injury-time as Scully rose to head an Adam Hanlon free-kick past Gerard Doherty. Play was decided scrappy in the third quarter on the heavy Finn Park pitch but Harps doubled the lead on 75 minutes as Curran, who moved to Harps during the close season, sprung woeful Derry attempts to play offside as he ran unchallenged to slot past Doherty. Against the run of play, Patterson scored in the first minute of injury-time with Nathan Boyle also going close as Harps nerves were strained in the closing seconds. But the Donegal club held on for the win they deserved on their first Premier Division game since 2008.